Microsoft OneNote is a beefed-up word processing program. You can enter text and graphics to gather, organize, search, and share literally anything you can think of — meeting notes, ideas, references, instructions, brainstorms, and so on. Unlike word processors, however, OneNote lets you input free-form sketches, add unbound text, insert screen captures, and record audio and video directly into any section of the application’s page. OneNote Web App is the online companion of the rich desktop OneNote application. Both versions share a similar user interface, making it easy for users to quickly get started using the web app with little or no learning curve. 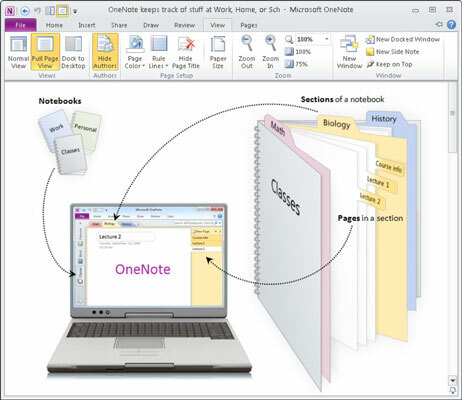 Information in OneNote is stored as a page that becomes a part of a section belonging to a notebook. A notebook can be like a binder you use to keep track of your personal activities with tabs for home remodeling, finances, and events. In the home remodeling tab, you would have pages with a link to your house plan, contact information, drawings and sketches, photos of lighting and fixtures. Because OneNote Web App is browser based, most users with light editing and collaborating needs can get by without the desktop version. Because you can have multiple notebooks in OneNote, in essence, OneNote is all you need to be efficient and productive at home, at school, and at work. You can create and edit OneNote documents with the web app regardless of your platform (PC or Mac) or your browser (Internet Explorer, Safari, or Firefox). Documents are displayed on the web app in high fidelity, providing users with the same clarity and formatting as in the desktop application. Coauthoring in the web app is a snap because users can see each other’s entries in real time. Audio and Video Capabilities: Because it is meant as a companion — not a replacement — OneNote Web App has limitations. For example, opening a page with audio or video in the web app displays a message in the notification bar warning you that the page contains items that cannot be displayed. You can still view and edit the page, but you cannot play the audio or video. The audio and video icons on the page are replaced with the text [File] in gray highlight. Shapes, Images, and Tables: You can’t insert shapes on pages in the web app, but you can insert tables, pictures, clip art, and hyperlinks. Your handwritten notes or digital ink from the desktop OneNote application are displayed as an unknown object in the web app. Protection: Password-protected sections are not displayed in the web app. You are prompted, however, to open the notebook in the desktop application so that you can enter the password and view the sections. Search functionality is not available in the web app, although you can use your browser’s “find” function (CTRL + F) to find keywords on the page that is currently open. Text Editing: Basic text editing in the web app is pretty good. You can change fonts, apply formatting, and select styles. Unfortunately, the handy Format Painter feature is not available in the web app. Despite its limitations, OneNote Web App still wins hands-down compared to the competition in terms of boosting productivity in an organization. The mere fact that it allows users to access their notebooks from the cloud, share them, collaborate with others in real time, view version histories, find recent edits, see who made the edits, and sync with SharePoint online is not bad for a free app. Send content from the web pages to a section or page in OneNote complete with links! Ability to link to other notes — wiki anyone?